But critics said it was another example of Britain's "surveillance society". 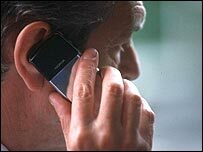 Minister for Security and Counter-terrorism Tony McNulty told BBC Radio 4 that the data could provide three levels of information, the simplest being about the phone's owner. "Say some old lady has got difficulties with someone who's repaired the gas in her house and has a mobile phone for somebody who's clearly dodgy," Mr McNulty said. "The local authorities can just get the subscriber information next to that number. "The second level of data is not simply the subscriber, but also the calls made by that phone. "And the third level which is purely for the security forces, police, etc, is not just the subscriber information and the calls made, but also the calls coming in and location data - where the calls are made from." A person's location can be pinpointed to within a few feet by identifying the mobile phone mast used to transmit their call. "There are actually a very broad range of purposes for which this information about who we've been phoning and when can be revealed," Ms Chakrabarti said. "It includes, for example, the Gaming Board, the Food Standards Authority and every district and county council in the country." "We're talking about a profile that can be built of your personal relationships on the basis of who you've been speaking to and when." Mr McNulty said local councils would only have access to data on "a legitimate and proportional basis". "(To say) that all of a sudden anyone and everyone's information is available, that all these authorities somehow have the right to go fishing and snooping, simply isn't the case," he added. Nick Clegg, Liberal Democrat home affairs spokesman, said: "Once again this government has been caught red-handed creating new surveillance state powers with no meaningful public or parliamentary debate. Councils would only be able to use the powers to "prevent and detect crime - not for the collection of taxes", the spokesman added.